Not until I was in seminary in Chicago, did I learn about a little bit of the history of Christianity in Japan; as I became a little familiar because of a course on world mission. Yet I had not encountered someone from Japan who is a Christian until seminary. In fact, prior to seminary, when I thought of religion in Japan, the beautiful pagodas and temples with ornate flower gardens stuck out in my mind. These structures are traditionally places of worship for the Shinto and Buddhist religions, so the idea of Christianity in Japan never crossed my mind. Nor did I ever think I would meet a Japanese Christian, but I met Toshio who was a fellow seminarian and a member of a different religious order than the one to which I belonged; and I truly wish I could have talked with him more about Christianity in Japan because there is more history than I ever learned in that world mission course, but never got the chance to learn more from him. When doing some research about Saint Paul Miki and the other Martyrs, I learned that Christianity in Japan dates back to the mid-16th century with Saint Xavier bringing Catholicism to Japan. Initially, Christianity was rather well received in Japan because the government felt it would assist in the trade with Spain and Portugal, as well as limit the power that the Buddhist monks had within society. Unfortunately, this support did not last long because the government saw how the Spanish gained control of the Philippines through colonialization, and the local government had no real power. Practicing Christianity in Japan was banned in the 17th century and if anyone refused to give up their faith would be executed. In turn, Christianity became an underground religion until the return of missionaries in the 19th century. During the time of the persecution over 200 people were killed in a forty year span, and they came from various walks of life; some laity including children, while others were diocesan priests or belonged to the Jesuit, Franciscan, and Dominican religious orders. 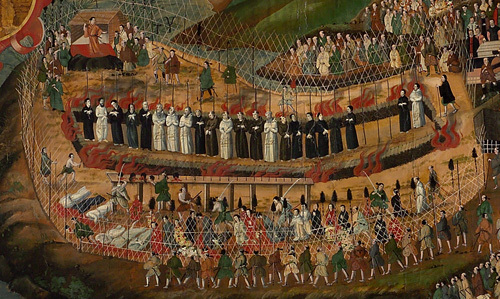 Even though there were a large number of Japanese Christian martyrs who were beatified in 1867 and 1981, Saint Paul Miki and his companions belong to a group of 26 martyrs who were canonized by Pope Pius IX in 1862. What makes Paul Miki special is that he was the first Japanese Christian to belong to any religious order – the Jesuits. Along with the other 25, he was crucified one month prior to his ordination. As we see in the reading from Genesis, God has started to create things of this Earth and each has its specific purpose. We do not get to see the part of the Creation story where God creates humans, but we are part of that story. EVERYTHING, including humans, has a purpose intended of us by God. We are to be stewards of Creation, and be evangelists of the Gospel. These are part of our mission, regardless if others reject and persecute us for our faith; just as the Japanese government persecuted Christians and those defending their faith were executed for not abandoning the faith. Saint Paul Miki and his companions mirrored the Gospel reading. As missionaries, they ministered to the people of Japan, doing whatever had been called of them by God. We see in the Gospel that people from all over sought care and healing from Jesus. We know how the story ends, yet Jesus had His purpose; he was on Earth to preach the Good News of God, even until death on the cross. We as Christians today, do not face a banning of our faith by our governments, yet there are times in which we need to stand up for our faith because of persecution of non-believers. We may even be attacked by other Christians because of certain beliefs about social issues. It may seem so easy to just give in and “follow the masses” to avoid the persecution, but we need to defend the faith and hold to our principles when they teach the Gospel. The life and mission Saint Paul Miki and all of the Christian martyrs is the example we should look to in our everyday Christian life. Father, provide us with the strength and courage to defend the faith every day of our lives, especially when it seems so easy to just give in to avoid persecution. This we ask through Christ, Our Lord. Amen.